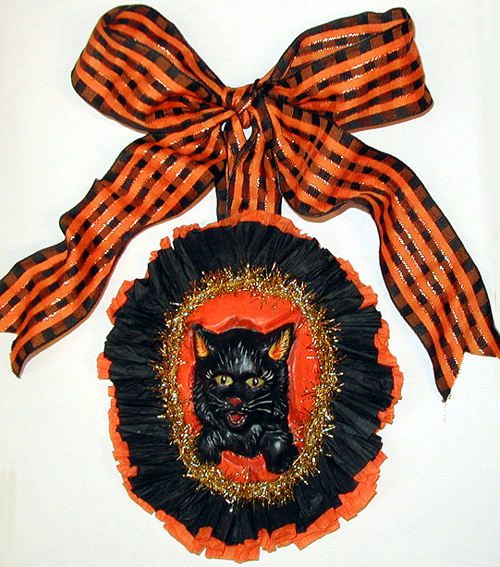 Bring a piece of New England folk art into your home for the Halloween holiday with this unique hand crafted Halloween Cat Ornament. This wonderful figure was inspired by Antique German paper mache folk art figures, hand crafted using an antique chocolate mold. Offered here is a hand crafted limited edition Halloween Cat ornament by artist Kathryn Campbell of Bittersweet House Folk Art. 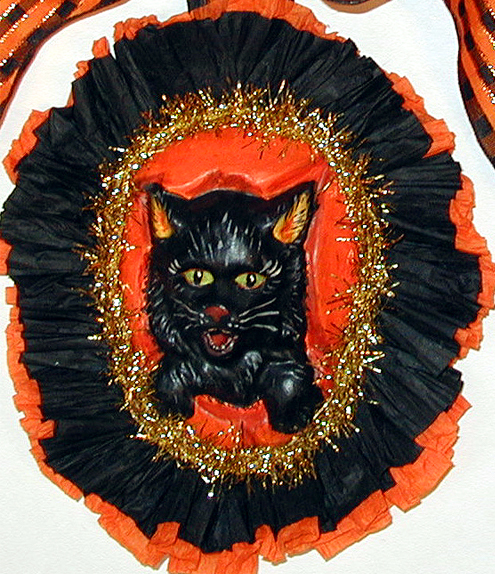 Of special note: Halloween Cat in a Pumpkin cast in chalkware from a rare vintage German chocolate mold, gold tinsel roping, ruffled paper trim and a beautiful gold threaded fabric ribbon. This absolutely charming Halloween ornament, measuring 8 inches (including ribbon), is hand signed "Bittersweet House Folk Art, K. Campbell, 2005, Sherborn, MA".